Martin Jumbam: Professor Daniel Noni Lantum – I salute you! (Final Part). Professor Daniel Noni Lantum – I salute you! (Final Part). In this second and last part of my tribute to Professor Daniel Noni Lantum, I recall how instrumental he was to me during my early years abroad, urging me to have a clear sense of purpose and to focus my attention on my work and not on my financial situation, that was far from glamorous. Upon my return home over a decade later, he was still there to welcome me and my family and gave us a soft landing on territory that was beginning to feel the grueling impact of the world recession. Let’s pick up the narrative from 1976. I was successful in my degree examination and was awarded a Bachelor of Arts Degree in Bilingual Studies. Back then, jobs for bilingual degree holders, as for many other graduates in other fields, were easy to come by. I remember dropping applications for a job at the National Assembly and at the Presidency of the Republic. Some friends of mine, who leaned towards teaching, took the road to the Higher Teacher Training College, known in French as “Ecole Normale Superieure”, where they were given admission on the spot. Professor Chindje Kouleu, who was teaching at ESIJY (the Yaounde School of Journalism), said he would be happy to have me on board. I had met Professor Chindje in Aix en Provence in southern France the previous year when my friends and I went for a language immersion course. He left shortly after our arrival to come back to Cameroon where he got a job in ESIJY. When we returned from France, I met him on several occasions and he thought I was good material for journalism. A few feet away from Ahidjo? I discussed all these options with Professor Lantum and he said I still had a place by him, pending something more permanent. In early September 1976, I received word, through my late friend and brother, John Sabbas Bime, ‘John B’, to the intimate, that I was wanted at the Presidency. He was already a seasoned translator and conference interpreter in the Linguistics Service of the Presidency. After passing through several layers of security screening by guards, who seemed as if a smile had never crossed their lips, I was ushered, trembling like a leaf, into the translation office of the Linguistics Service. I was met by a certain French lady, Mrs. Atangana and the late Mr. William Mbelem. They said they had received my curriculum vitae and seen that I once studied Spanish. I told them I had received a pass in Spanish at the London GCE Ordinary Level at the Bilingual Grammar School in Man O’War Bay, but that my Spanish, for lack of use, had become fairly rusty. They said it didn’t matter how far back I had studied Spanish. They then gave me a piece of paper and asked me on the spot to write an application to the Secretary General for a scholarship to study Spanish in Madrid. The plan was that from Madrid I would then go to Paris or Washington, DC for translation and interpretation studies. It was the most amazing thing in my life. There I was, inside the Presidency of the Republic, the citadel of supreme power in Cameroon under the dreaded Ahmadou Ahidjo, who, at that moment, was perhaps just a few feet away from me. I even thought I could feel his breath on my neck. Boy, was I ever eager to get out of there! Confusion ran riot on my face and in my mind. Had it not been for the presence of my friend and brother, John B, I would’ve told them I was still going to think about it. John came up to me and congratulated me and laughed my confusion away. “Go for it,” he said. That’s when I wrote the application. Before I left, I was told to prepare because my departure for Madrid was to be in a week’s time. Just enough time for me to get a new passport and I would be leaving. I came back to the office to tell Professor Lantum what had happened and how confused I was. He wondered why I was confused and instead gave me a hearty congratulation that greatly oiled the hinges of my self-confidence. I had also been worried because there was no family member of mine around, my brother, Kenjo, having been transferred to Bamenda. I felt uncomfortably alone and lonely and Professor Lantum’s reassuring words came as a balm to my heart. “Don’t go,” said Professor Fonlon. A week later, I was called to the Presidency and given my passport and a plane ticket and instructed to go to the Spanish Embassy where a visa was affixed to my passport. A few days to my departure, I had an unexpected visit from Professor Bernard Nsokika Fonlon, may eternal rest be his! He didn’t visit me, he sent for me and I met him in his office. He said he had heard that I was about to leave for Spain. I said he was correct. He then said he had been eyeing me for a position in his department and that he thought it wasn’t too late for me to cancel my departure for Madrid and he would give me a teaching position with him. He assured me he would do all in his power to ensure that I got a scholarship for studies that would lead to a doctorate from an American university. Some months earlier, he and I had discussed the possibility of my applying for a position in an American university to study Afro-American literature with the view to coming back and teaching in his department. We had even toyed with the idea of my applying for admission into Al Ahram University in Cairo, Egypt, to study Arabic. Professor Fonlon’s contention was that there was a lot written in Arabic by Cameroonian Muslim scholars in North Cameroon that needed to be translated and made available to the academic world. If I studied Arabic in Cairo, I would then come back home and focus attention on the mass of literary work produced in the North in Arabic which, unfortunately, was virtually inaccessible to the rest of the academic world. He thought he had sufficient clout with the Egyptian authorities to obtain a scholarship for me to study there. He saw his department taking a lead in that area and introducing Arabic studies at the University of Yaounde. My decision to take a totally different route in life laid waste all those plans he was beginning to nurture for his department. As we talked, he said something quite poignant when he asked me to look at him. “I am no longer a young man,” he said, “and I don’t have long to be at the University. I’ll really be happy if you are on my staff before I finally retire.” Looking at him and seeing how helpless he looked, I felt a lump crawling up my throat and the confusion I thought had finally gone to rest, resurfaced. Before me that morning, Professor Fonlon suddenly appeared frail, weak, old and frustrated. My heart nearly missed a beat. I told him I would think about it. I don’t know if he realized how helpful his words were to me. I walked out of his office and went straight to my friend and brother, John B, to tell him I was leaving. Access to phones was not as easy in those days as it is today and so I couldn’t reach any of my family members in Bamenda or Nso to tell them I was leaving for Madrid. Professor Lantum said I shouldn’t worry about my family. They would understand once they received a letter from me from outside the country. I still had one difficult step to take, though: go back to Professor Fonlon and tell him I had weighed his offer carefully but would not be taking it. And that is what I did the next day. I thanked him for his confidence in me but said I was leaving all the same. He seemed shattered by my decision but said he understood me and wished me well. My ‘defection’ notwithstanding, Professor Fonlon and I remained good friends till he answered his Maker’s call in August 1986, ten years later. I recall that in the summer of 1984, two years before his demise, he and I sat in his hotel room in the Canadian city of Calgary, where he had been invited to a literary conference. I was then a student of Comparative Literature Department at the University of Alberta in Edmonton and had travelled to Calgary for the said conference. This was shortly after the botched coup d’etat of April 1984. He told me about the thick cloud of suspicion that was hanging over his head because the Biya regime was convinced that he was in collusion with the coup plotters. One thing he said, and quite categorically too, was that he had worked very closely over the years with Ahidjo, whom he called in Lamnso “wir-gassah” (the Hausa man), and that he was not prepared to denounce him, as some others were doing at the University. He loudly regretted that university professors, who had literally licked the ground on which Ahidjo walked, were now the ones loudly denouncing him because they wanted to be in President Biya’s good books. He thought their action was tantamount to intellectual prostitution of the worst kind. University dons should take stands on issues and not vacillate like leaves in the wind, he thought; and that is what he did, damning the consequences. In the course of our discussion, he recalled how sad he had felt that I had not joined him back in 1976. He then wondered, given the chaos back home, especially among university circles, whether I hadn’t been right not to remain there after all. I told him I had discussed the matter with Professor Lantum who had urged me to leave. He said that, with hindsight, Professor Lantum’s advice was probably the right one. John B, my brother, thank you! Even though this tribute is mainly to Professor Lantum, I’ll like to highlight for praise and infinite gratitude the role my friend and brother, John B, played to ease the feeling of confusion I felt shortly before my departure. On the morning of that day, I asked the taxi driver taking me to the airport to stop over at his house in Melen. He had told me he would like to accompany me to the airport. As we were about to leave, he gave me a fur-coated jacket that was to save me from the Madrid cold that winter. I was leaving Cameroon at the onset of winter in Europe totally unprepared for it. Had he not given me that fur-coated jacket, I would’ve had it rough in Madrid. John, my friend, my brother, you are no longer with us but know that I cherished that gift immensely. You were a life saver. Thank you, my brother. Several years later, John was to remind me of that day I left for Madrid, drenched in tears. We were sitting in my office in Douala where I worked for an American oil company. John would always drop by whenever he was in transit through Douala. He recalled that as he stood at the airport watching as I boarded the plane, he suddenly saw someone racing across the tarmac to the plane. To his surprise, it was Professor Lantum. He wondered where the Professor was going and why he was boarding the plane just as it was about to taxi down the runway. Inside the plane, I did not know what was happening outside but I recalled that as the plane was about to leave, I suddenly heard someone call my name. I turned round and it was Professor Lantum coming towards me. He immediately handed me an envelope, wished me well and disappeared. I was so stunned that I didn’t know what to do or say. As the plane taxied down the runway ready for take-off, I opened the envelope and it contained a hundred thousand francs CFA. I wept openly for I had practically no money on me, the Spanish Embassy having told me that I would only receive my stipend from their Foreign Ministry the day classes began, which was still several weeks ahead. It took the Spanish Foreign Ministry several months to start paying me because it was said that my documents had still not arrived from Yaounde. I remember writing a letter dripping with frustration to Professor Lantum, wondering aloud if my departure for Spain had been such a bright idea after all. I told him how the Spanish government was not coming clean with its own part of the bargain and that I was practically broke, desperate and totally frustrated. I must’ve sounded suicidal for Professor Lantum sent me a magnificent reply to my letter that brought me back to my senses and made me face the reality of the life I was then living. He delved into Nso martial history, reminding me that we, Nso people, have always been fighters from time immemorial; that no Nso man worth the name ever fled from the battle field, and that every Nso man, who has ever fallen in battle, did so with a spear sticking out of his chest, never out of his back; and that only cowards, in their flight from the carnage of the battle field, received the spear in their back. He didn’t think I was a coward and he knew I could and would make it, temporary problems of money and adjustment to a new culture notwithstanding. I had never received such a heart-warming letter before, nor any ever since, and, poor as I remained for a good part of the first months in Madrid, I never again questioned the wisdom of my presence in the Spanish capital. In fact, I even started to laugh my troubles away. I just didn’t focus on poverty or loneliness anymore. I had a definite purpose in mind, that is, study the language and head on for greater pursuits. Surprisingly, as I began to realize that I could not change the world to fit my mood, I started to focus on changing my mood to fit the world. I realized that no amount of kicking and screaming was going to make the Spaniards pay my stipend any time soon, so I decided not to make the non-payment of the said stipend an issue for a court case, and, with my mind focused on other things, I began to enjoy my studies. I even began to make friends with Spanish and foreign students alike. I even received a proposal from one student to move into an apartment much closer to the university, which he was sharing with four other students. We called it “las Naciones Unidas”, the “United Nations”, because we came from different countries of the world. One fellow was from the United States, representing North America, another from Peru, representing South America, one from Japan, representing Asia, I from Cameroon, representing the great continent of Africa, and there was a Spanish guy, home bred and proud of his historic city, Madrid. To him, Madrid was the center of the universe. Was it not from Madrid, then the center of civilized humanity, that the great conquistadores had fanned out into the world, planting the Spanish royal flag in remote corners of the world, especially in the Americas! “Viva, Espana!” What a great chap Pablo was! Life became fun as we would buy bottles of excellent Spanish wine and chill out in the living room in the evening, listening to Spanish flamenco dance music oozing out of the turn-table at the corner. Before Professor Lantum’s letter, I was a grouchy and sullen man and none of the students with me in class dared approach me, which increased my feeling of despair and loneliness. After his letter, I took control of my life, changed my focus to more productive pursuits and Madrid became a marvelous city for me. I did not suddenly become richer, but I ceased to think of myself as a poor helpless African student, waiting cap in hand for a hand-out and venting my bile to whoever was near enough and willing to listen to me. This was thanks to Professor Lantum’s robust reminder to me that I needed to lift myself out of that complaining phase and go on with my life. In the face of adversity, chickening out was not the solution. Staying focus on what really mattered, was. Upon my return to the country in late 1984, months after the botched putsch against the still stuttering Biya administration, I went straight to Professor Lantum’s office, that same office that held many memories for me, being the springboard from where my initiation into the world of translation took off nearly a decade earlier. Same office, same desk but different secretary. The one whose bosom had caught my lecherous eye some ten years earlier had left. In her place, sat another one, who wasn’t much to write home about in terms of looks, but who turned out to be a very nice person to work with, reserved, respectful and motherly. As soon as Professor Lantum saw me, he asked me to take a seat. He was still working with the World Health Organization (WHO) on projects in Mbandjock and the Bamenda region. This time around, I was already a seasoned, certified translator/interpreter, no longer the frightened greenhorn, fresh-out-of-school-baby translator that I was when, years earlier, I pored over volumes of documents on traditional medicine. Even during the nine months I worked for the Economic and Social Council in 1985, a period I consider a total waste of my precious time, I still collaborated with Professor Lantum. I felt proud to have assisted him to organize a seminar on sterility in Cameroon that made headlines for weeks in the local media. Professor Lantum writes extensively on just about every topic imaginable: medical literature, poetry, biography, sociology, etc. He is also a well published man and, I believe, a well read one too. I have had occasion to review some of his writing for the media, and I have not always been tender towards him. I believe my role as a reviewer is not to flatter the writer but rather to give an honest appraisal of the writer’s work, mainly from the point of view of form and substance. As regards substance, I could not always pretend to give a fair appraisal of topics of a medical nature but I would focus attention on the form, that is, the language carrying whatever message he wanted to transmit, and how the work was structured. As a biographer, he has given due respect to some of his contemporaries who have gone ahead of him: Father Aloysius Wankuy, the first West Cameroonian Catholic priest and Professor Bernard Nsokika Fonlon, whom he calls his friend and brother. His knowledge of Nso culture is unrivalled and he has several publications in that area dating from the early days of his student life in Nigeria. 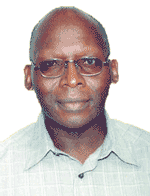 He has also produced scholarly publications in medicine and in relations between the Nso, the Bamum and the Bafia, commonly called the “Mandjara”, the Bafia word for “brother” or “sister”. History has it that these brotherly people share a common ancestor. Historical forces beyond their control dispersed them in the Center, West and Northwest Regions of our country. Of late, Professor Lantum has been very instrumental in bringing these brotherly peoples together in cultural activities that have greatly enhanced dialogue and understanding among them. Professor Lantum, aka Shuufaay wo Bastos, whenever I peer down this road of life which the good Lord has permitted me to walk all these years, I see you standing at strategic locations, serving as a sentinel pointing the way out of difficult situations, especially during those early years of my adult life, and I want you to know I am grateful. You firmly placed me on the road I’ve walked all these years, the road of translation and conference interpretation. On this sometimes bumpy road, I have raised a family and seen my three children grow and prosper. You have my infinite gratitude. I did not want to wait for you to answer the Master’s inevitable call to recall to other’s ears all that you’ve been to me and done for me. I want you to hear them from my own lips when both of us are still alive and active. I am penning these words on a cold night in the quiet precincts of Paul VI’s Memorial Center in Mendankwe Bamenda just a few days after my sixty first birthday. Sixty one years on the surface of the planet earth is not sixty one days, to put it mildly. At sixty one years of age, retired from active duty but endowed with good health, I can only thank God Almighty for making it happen. The list of boyhood friends of mine, who have not been so lucky to count as many years as I have, is lengthening by the day. That is why I deemed it necessary to take a few days off to be alone and to look down the long, winding and sometimes slippery road I’ve walked all these years and to thank you for your part in it. On this moonless night, drenched in rain, wrapped in a cold wind that is noisily assaulting my window pane, I thought I should thank you, dear Professor Daniel Noni Lantum, for the role you played, unknowingly perhaps, to make me what I was yesterday, and what I am today. May God bless you, Sir. Thank you very much Mr Martin Jumbam for your well researched articles and encouraging stories from Cameroon.keep it up brother in the lord! The greatest humility and show of appreciation can be summed up in two words. "Thank you". Thank you Shufai wo Bastos for being you. I have read Tav Jumbam’s posting and it has struck a nerve like he will never know. Tav it is amazing the role Shufai Wo Bastos played in your life and it is rewarding to hear you say thank you. Many of us has been impacted by him over the years and this gives us a chance to reminisce and Thank Wo Bastos for being them. So inspiring especially to learn how interactions and cultural aspects can shape who we are. It so amazing how with the influence of two very renown role models you could manage to take a decision that would shape you life forever. Prof is a fellow member of CMA Mvog Ada, and I tell you he is inspirational to us all. I am happy to be informed of the importance he served in your life. We look forward to him for advice on how we too can meet up not only on our professional lives but spiritual enrichment. Thank you immensely Mr. Martin Jumban. Its good to know that even in death my beloved uncle and father Mr. John Bime fondly called 'JB' is still acknowledged for his friendly and fatherly love he had showed to all while on earth. I know he is resting in the Bossom of our Lord. This is one of the most articulate write ups i have ever read.The honesty translate to a much bigger thing than just appreciation. Oh Nso how many Prof Lantums and Fonlons still exist. Tav only you can be this honest. What a gem! Martin, your memoirs will be both educational and much fun to read. Nso land, Yaoundé, Bamenda,Aix, Madrid, Paris, DC--hey school boy--Edmonton, Calgary, Mammoth Caves in Kentucky, Gainesville, St. Augustine, Florida, Princeton, the Philly area, among so many other places. What a fine life for a good man, buddy!